ok, i know, 3 posts in one day, it never rains but it pours, but this is too good not to share. Over at BrowniePoints there is this image atop one of the sidebars. This is GENIUS on so many levels. Love it! Ahhh, EOMEOTE, my favorite foodblogging event! I love the story behind it, i love the low-rent spirit of it, and i love the eats. *contented sigh* This month, continuing with the spend-less-on-food project currently underway here Chez Foodnerd, I am trying to eat all the stuff I have stashed around my larder. Today breakfast was the last of the frozen waffles that have been kicking around the freezer for well over a year, plus a last bit of magic bacon I forgot about in the fridge, the meyer lemon marmalade I made last week -- too thick because I am incompetent with all sugared foods but delicious still, and boiled cider that my mother gave me at Christmas. Waffles are I suppose not technically toast, but I think these qualify for two reasons: 1, they were dredged up out of mealtime desperation, and 2, they were prepared in the toaster. Boiled cider is quite lovely, and I am glad to have the excuse to blog about it -- it looks and functions like maple syrup, but it's got the tangy fruitiness of apples, so it's much lighter feeling than maple. Tallasiandude didn't dig it so much; he got out the maple to go with his EOMEOTE, which also he deconstructed so it was more an EOME next to TE. 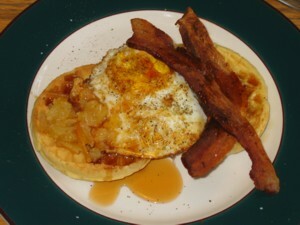 But mine was a salty, bacon-fatty, tangy treat, with the tart lemon and cider sparking up the egg and bacon and waffle into something really rather nice. Oh my goodness, I love pork fat. Trafe in the extreme, but oy vey, so delicious and soft and rich. Sorry the picture is such crap, but we were mostly done snarfing this one up before I realized I needed to photograph its glistening chestnut-brown fabulousness. So whilst shopping for noodlefest '05 (post promised soon, according to tallasiandude) we picked up a piece of pork thigh, bone in skin on, at the Super 88 Market. We never used it for the noodles, so we stuck it in the freezer, and today I didn't feel like going out to shop so I grabbed it and cast about for recipes. Big Book of Chinese Goodness came through as usual, with two recipes that I combined: Red Cooked Pork and Dong Po Pork (i suspect this of being a version of the Tung Po pork I loved so much in LA). Boil water in a saucepan large enough to hold the pork, and blanch it for about 5 minutes (less than 10). Drain and rinse. Put into a braising pot with the rest of the ingredients, bring to boil, then lower heat to low and simmer covered 3 hours, turning occasionally, until the meat is falling off the bone. 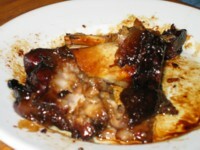 This will give you a luscious mahogany-colored mess of a dish, full of flavorful meat, soft creamy fat, and unctuous skin. Eat it with rice, and lots of vegetables, perhaps some pickles -- the meat is so rich, you want clean veggie things to cut through the fat. Also note that this 1.5 lb piece of meat was a paltry $1.20 at the chinese market; granted, it only fed two with no leftovers, but we are *happy* with our dinner, let me tell you. Made the Sticky Vietnamese Chicken from the current Gourmet, and it was pretty good -- but I would put more fish sauce in it next time, as it was a bit mundane in flavor. Perhaps also the lack of lime juice didn't help; I had to use the last-resort lemon juice from a bottle. Tasty with the pickle-slaw and sriracha that went with it though, and I can't complain. 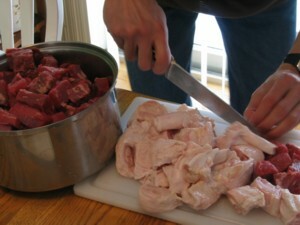 Cut chicken into slices -- I cut each thigh piece into 3-4 bits -- for better grilling. Whisk rest of ingredients together, and marinate chicken 15 minutes. Grill on grill pan or on outdoor grill (recipe says 1 min per side; use your judgement). Serve with rice, more sriracha, and pickle-slaw (shredded carrot and/or daikon and/or cabbage, in dressing of white and/or rice vinegar, 2 cloves garlic minced & smashed to paste w/ 1 tsp salt, splashes of fish sauce and sherry, and a few tablespoons sugar, plus a bit of vegetable oil). 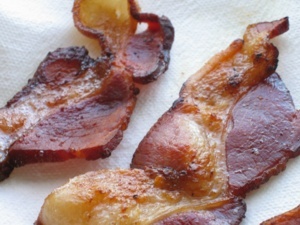 mmmm, baaaacon. This is the last of the magic bacon from Hollins Market in Baltimore, in all of its glisteny glory. We ended up with a big pile of grape tomatoes teetering on the edge of spoiling, from a friend who couldn't figure out where she'd use them up. Happily, the most recent issue of Cook's Illustrated had a recipe for roasting grape tomatoes to make a pasta sauce, which had struck me as intriguing. Works pretty good, and if you ignore their instructions to mix things in a bowl, and just dump everything onto a baking sheet and stir, it's easy to do and to clean. I would say you need a LOT of tomatoes, so it's not necessarily economical, but if you can't stand another day without a fresh tomato dish, this'll do ya. It would also be pretty nice for company, since it doesn't take a lot of doing. Heat oven to 350F. 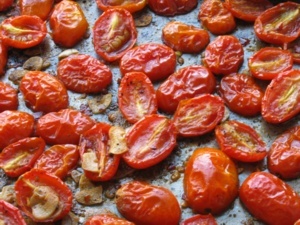 Dump the halved tomatoes on a baking sheet with the garlic slices. Glug a bit of olive oil over it, sprinkle with salt, pepper, sugar and red pepper flakes to taste. Stir to coat the works. Splash the vinegar over and stir again. (Cook's said to slice some shallots, mix with some oil and put them on top, but i didn't have any -- it's fine without.) Roast without stirring 35-40 minutes, until the tomatoes are a little shriveled and soft, but the garlic isn't yet burnt. I mixed this with some sliced pepperoni (paprika salumi, really), and reheated it in the oven for 5 minutes, then dumped it onto penne and topped with thin slices of strong provolone. You could mix in all kinds of stuff -- artichokes, capers, cheeses, herbs, tuna, whatever you happen to have around. I think it would be pretty nice with a roasted chicken, which you could do in the same oven, and a green salad. We ate it plain, since we are clearing out the fridge this week and don't have much to work with. Hungry last night, not a ton in the house, trying to cook economically these days... here's the delightful dinner we ended up with. Get a supermarket rotisserie chicken, ideally a cold leftover one that's marked down 2 bucks. Boil some potatoes. Slice up a bit of green cabbage, and chuck into skillet with a hefty drizzle of heavy cream, some salt & pepper, and a pinch of dried thyme, and saute on medium until cabbage is soft and cream is reduced. If you have no cream, use a bit of butter and whatever liquid dairy you do have. Mash potatoes with butter, a bit of cream, and paprika paste (which i got from a friend in Hungary, but I suspect can be approximated with some very spicy paprika or cayenne, a bit of tomato paste and/or butter and/or water). 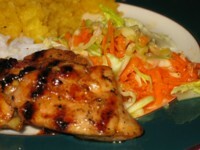 Put the chicken legs and chunks of breast into the cabbage to reheat. And then you have spicy mashed potatoes and creamed chicken with cabbage, which is intensely satisfying, quick to cook, vaguely French, and dead cheap. Sorry for the lack of posts, people -- it's been really busy. Oy. tallasiandude has returned from China, and he has brought with him a bunch of magical teas which come in the shape of little walnut-sized balls. The tea itself is delightfully fragrant and delicious, and just sniffing the hot steam as it steeps is pleasure enough. However, the magic comes when hot water is added to a ball, and it unfolds into a spiky green starburst with a flower in the middle, sometimes jasmine, sometimes other flowers. The one last night turned out to be a red globe amaranth, a decorative flower my mom used to grow for dried arrangements. And the starburst is formed by tying long tea leaves together with a string, with the wee flower in the center captured into the bundle so that the flower sits atop the cut ends of the leaves. 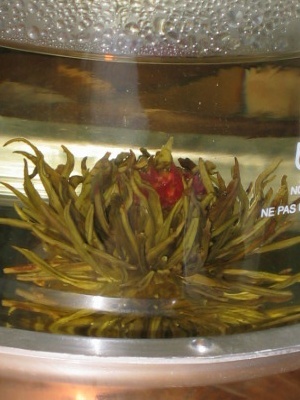 Then the leaves are wrapped down and around the flower, hiding it and forming the tight little ball of tea. Very clever, and a joy for all the senses. My parents froze some turkey for me at Thanksgiving, and I've been using it this past week, just to make room for the meyer lemon granita I wish to make with the rest of hedge's lemons. *drool* And you know, turkey cacciatore is okay, but really just sort of un-thrilling. But just now I made turkey salad out of the last of it for lunch, and I hope I don't throw out my shoulder patting myself on the back, but damn it was good. Dice cooked turkey fairly small. Also small-dice scallion, celery and granny smith apple to taste. Sprinkle with a couple pinches of dried tarragon, crushed, a good shake of lemon pepper, some extra fresh ground pepper, and a bit of salt. Mix all of it with equal parts mayonnaise & miracle whip. This can be put on a sandwich, but to make it even better, put it on top of torn romaine & some sliced granny smith apple tossed with olive oil, sherry vinegar and a pinch of salt. Yum!